About the author: Dr. Anton Yuryev has M.S degree in Physics from Moscow Institute of Physics and Technology, Russia and Ph.D in Genetics and Molecular Biology from Johns Hopkins University, USA where he discovered proteins physically linking gene transcription with mRNA processing in eukaryotic cells. He has over 20 years of experience in bioinformatics. 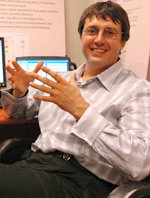 After finishing his post-doctoral training at Novartis Inc Dr. Yuryev worked as Senior Scientist at InforMax, then continued at Orchid Bioscience as Senior Bioinformatics Analyst, and then as Senior Director of Application Science at Ariadne Genomics where he participated in the development of natural language processing technology and award-winning Pathway Studio software. Dr. Yuryev has published more than 40 scientific publications, edited three scientific books, and authored several algorithms for primer design and pathway analysis. He works now as Professional Services Director at Elsevier and responsible for development of targeted bioinformatics solutions using Elsevier software and knowledge bases for areas of drug development, personalized medicine and agrobiology.